Tech Guru, a Minneapolis IT support company that cares for businesses nationwide, received word recently of a top honor. We were named one of the fastest-growing private companies in America, according to Inc. Magazine. Find out what that means, how we did it, and how you can do it too! At Tech Guru, we don’t dwell on the awards and accolades – though there have been plenty. We are always grateful to be recognized as IT experts who care as much about our clients’ businesses as they do, but our day-to-day work is keeping everyone’s technology running so smoothly that we’re practically invisible. In other words, if our clients forget about us, we know we’re doing our job well. Making the Inc. 5000 list is a little bit different, mainly because we posted about it on Facebook, Twitter, LinkedIn, and Instagram, and everyone seems genuinely curious about this award. “What is the Inc. 5000 Award?” clients have been asking. “What does Inc. 5000 mean?” and “How is Inc. 5000 calculated?” We thought it would be useful to break down our experience as first-time honorees for others who want to apply. Applications were due by May 1, applicants were notified if they made the list in mid-July, and the list went live on the website in late August and in the September print issue. In October, honorees past and present join together for the Inc. 5000 Conference & Gala (2017’s event will be held in Palm Desert, CA), where great speakers and networking opportunities abound. What’s happening in Palm Desert October 10-12? Among many wonderful speakers, three key faces stand out. The first is Brene Brown, known for her work on vulnerability and the author of several books on the theme. Daymond John is also a bestselling author and founder of athletic wear company FUBU. Last is Alan Mulally, famed president and CEO of the Ford Motor Company. And to balance out all that sitting and listening, there are also social opportunities in the form of a golf tournament, a group morning workout, and cocktail hour. All stretched out over 3 days at the beautiful JW Marriott Desert Springs Resort & Spa. Opening up your books for all the world to see can be daunting, so what’s the payoff? Inc. suggests being on the list gives you exposure in international, national, and local media opportunities. Your company’s productivity could improve with juicier bait for recruiting and better morale for existing employees. And finally, greater momentum with investors and prospects could increase your sales advantages, bettering your bottom line. The years evaluated for the 2017 award were strong years of growth for Tech Guru. Sales revenue grew to $2.5 million, exceeding Inc.’s minimum figure of 2 million. Three year growth measured at 201%. 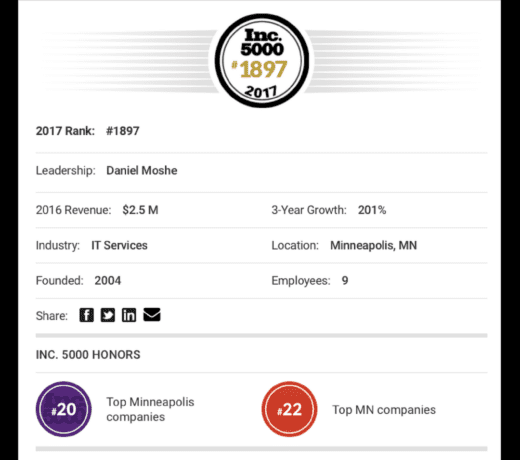 The numbers were good enough to rank us #20 in Top Minneapolis Companies on the list. What might come as a surprise to some is the importance Tech Guru places on certain metrics. “We have goals for sales numbers, but they are a trailing indicator,” the CEO observes. “If those numbers were to go down, it would be too late.” Instead, the company focuses on leading indicators, and take into consideration how much time team members are spending on the phone. “Number of Connector Meetings,” for example, is a key metric for continued growth. “We try to have conversations with people who refer clients to us, and who are natural-born connectors,” Dan explains. On a weekly basis, Dan and Tech Guru president Micah Thor track how many conversations they have with connectors about their companies. They talk about business strategy, and how Tech Guru can help their company further its vision. Conversations sometimes turn into more leads, leads become proposals, and proposals mean new clients. Tech Guru intends to make the most of the opportunities the Inc. 5000 award presents. We will strike while the iron is hot when it comes to making new client connections, and continue to build our relationships with the clients and vendors who have enjoyed the ride with us thus far. Our company may have started as a one-man show, but we will continue to grow and, if it’s in the cards, make the Inc. 5000 again and again. Dan Moshe helps business owners in the Minneapolis area with all things tech, and is the CEO of the Caring IT company Tech Guru. He cares about your business as much as you do!